As long as this card remains face-up on the field, all effects of Spell, Trap, and Monster Cards that designate a card(s) in the Graveyard or that activate in the Graveyard are negated. Come on. We all saw this coming. EMoD picks CotDs, you obviously know that a near-staple or staple is going to be sitting in the Friday slot. Negates “Sangan”/”Witch of the Black Forest” (even if you Tribute them to Tribute Summon “The End of Anubis”). Negates “Dark Magician of Chaos’” “spell retrieval” effect. Negates “Vampire Lord’s” ability to return from the Graveyard. Negates “Dark Necrofear’s” ability to return from the Graveyard. 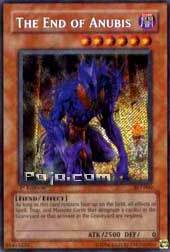 Prevents the activation of “Call of the Haunted” or “Premature Burial”, but does NOT negate the “if this card is destroyed, the equipped monster is also destroyed” effect when Summoned AFTER these cards are played. Will NOT negate the Special Summon of “Chaos Emperor Dragon - Envoy of the End”. Will NOT negate the Special Summon of “Black Luster Solder - Envoy of the Beginning”. Will NOT negate the Special Summon of “Dark Necrofear”, “Soul of Purity & Light”, etc. Will NOT negate “Fiend Comedian”. This is the other card that will be competing for your second Tribute slot. This card negates searchers and recursion...for BOTH sides of the field. So don't try to play this then Reborn something else. It's Witchable, can hold its own in battle, and has an effect that negates a major game mechanic for both players. If that doesn't sound like Jinzo already, I don't know what does. The list of can/can't negates pretty much covers the rest of what I would say. So I'll just go ahead and give this card its score. Well, well, well...here it is: the card that finally makes Summoned Skull completely obsolete. He's a one tribute 2500 attacker, something that's basically unmatched in this game. The DEF is an easy-to-kill-yet-Witchable 0 (which could hurt if your opponent plays Book of Moon or Enemy Controller). The effect is incredible. First off, let's set one thing straight: End of Anubis DOES NOT stop the Chaos monsters from being summoned. Got it? Good! So what can he stop? He stops Witch of the Black Forest and Sangan. He stops Sinister Serpent. He stops Monster Reborn, Premature Burial, and Call of the Haunted. He stops Mystic Tomato and Shining Angel. You can check the Netrep Files if you want a more complete list. But you can see that End of Anubis is a very effective monster: He stops a lot of widely-used cards, and he has incredible ATK to back it up. So, where does he fit best? Well, he's a great monster for Fiend Decks, as he won't stop you from summoning Necrofear (though he will, unfortunately, stop her from returning from the Grave) and his effect can almost be comparable to Hades, what with the negation of certain effects. You'll want to be careful running him, however; he can definitely backfire. This monster sounds as kewl as it's effect is. Ok, this is the next 000 SCR and it has one of the better effects. It stops cards like Witch, Sangan, Sinsiter, Vampire Lord, Soul Release, Big Burn, Disappear, Dark Magician of Chaos's effect about getting magic back, Spell Reproduction, Double Spell, Monster Reborn, Premature Burial, Question, Call of the Haunted, Marie the Fallen one, and I think it would prevent cards like Fear and Despair from the Dark, and Regenerating Zombie. The list can go on. 2500 ATK kills jinzo, Dark Ruler, just about anything. 0 DEF is equal to a Scapegoat token. 6 stars means you need to tribute for it. It doesn't stand up to Chaos, too. Note that it DOES NOT negate Chaos summons. Here is the reason, best said by Tranorix: "Necrovalley does negate because it plainly says, "you can't remove from graveyards" while EoA negates effects, but not costs and removing to summon Chaos is a cost." Overall, I give End of Anubis a 8/10. It's a decent card.